See the schematic explanation for the calculation. 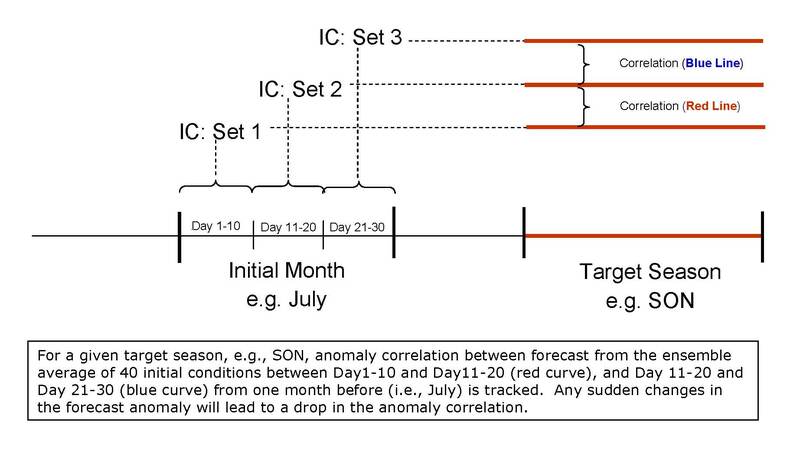 Consistency of the forecast is checked by calculating 1-month-lead seasonal-mean spatial anomaly correlation of 40-member ensemble mean between forecasts from the 1st, 2nd, and 3rd 10 days of each initial month. For simplicity, forecasts from the last one or two days of January are used for the 1st 10 days for February. For the months of 31 days, the 1st 10 days are 2nd to 11th of the months and the forecast from the 1st day is not used in the calculation. The x-axis labels include both the initial month and target season. PNA and NA (North America) are defined as: 180-300E/20N-80N. NA precipation (Prec) and 2-meter temperature (T2m) are for land only.